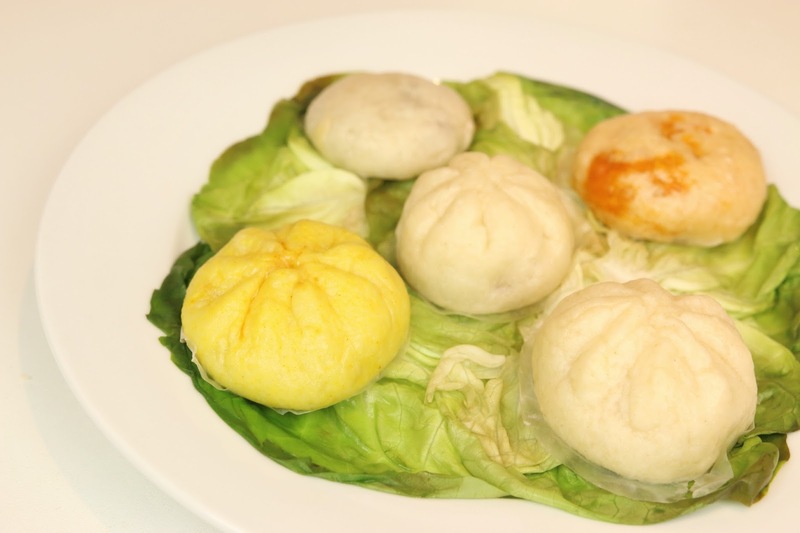 At this time of the year - especially when the weather gets shivering cold - I really start to miss these warm, steamed meat buns, which originated in China and are widely known as one of the popular dim sum dishes. Back in Japan, I used to enjoy these little-yet-filling snacks that were sold in almost every convenient store... not only did they taste delicious, but I absolutely loved how they contained all these various delicious fillings, as well! 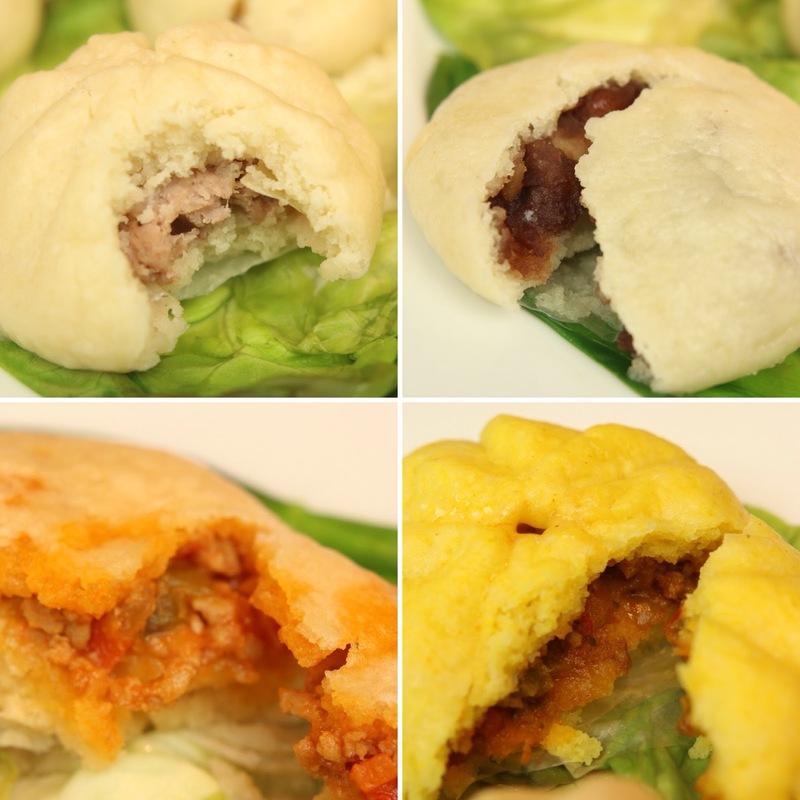 The recipe for my gluten-free steamed buns is as follows - with four different fillings; pork mince, cheesy pizza, curry, and sweet bean paste! 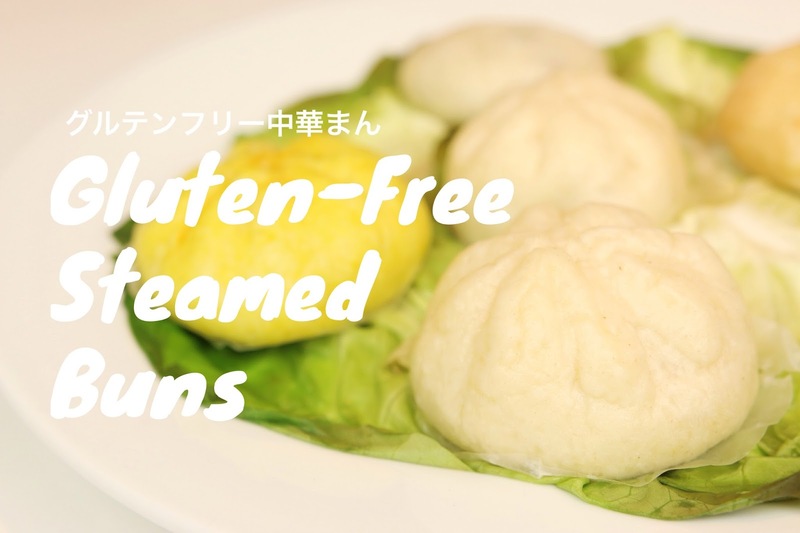 (Please note that the recipe calls for just a small amount of ingredients - as these buns are best served right after steaming. Also it may be because I personally prefer small-batch cooking ;) But if you want to make more, just double the amount of the suggested ingredients below). I spilled more than half the tablespoon of oil as I took this picture... oops! ・Extra flour to dust, and extra oil to prevent the dough from getting dry. * For this recipe, I used Doves Farm Free From Plain White Flour, which is a blend of rice, potato, tapioca, maize and buckwheat flour. As far as I know, if you are in the UK, you can get it for ￡2.19/a kilo when purchased on their website, and around ￡1.80-1.90 in supermarkets. 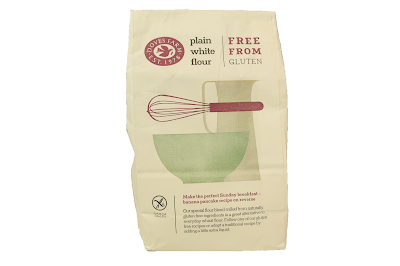 If you do not reside in the UK, you might try this recipe with the flour of your choice, just keep in mind that each flour absorbs liquid quite differently, so you may have to adjust the amount of milk required. ** For the sesame oil, I used Sainsbury's toasted sesame oil (£1.60/250ml), which I think was surprisingly cheap, delicious, and full of flavor. 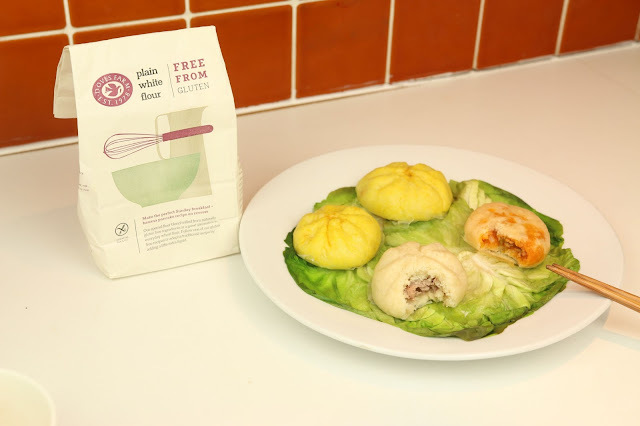 *** You will need to make the Japanese sweet bean paste filling in advance, as it will take quite a while longer than the other fillings! * First, place the beans in a pot of boiling water, then turn off the heat to the pot and leave the beans to sit for around an hour. When done, get rid of the water, and wash the beans well. In another pot, place the washed beans with enough water to cover them, and gently simmer for around 1hr 30mins until all the beans are nice and soft. You should occasionally add more water to keep the beans covered. Once the beans are soft enough - add the sugar, and gently heat until the sugar dissolves, creating a lovely paste. Finally, add a pinch of salt - and voila...! 1. Mix all the dry ingredients together to make a mixture, then gently add the oil and warm milk. Knit well for a few minutes until the mixture forms a soft ball. If after adding the oil and milk the mixture is still too dry to knit, try adding milk by the teaspoon (5ml). Also, if you fancy a coloured dough, here is when you can add tomato puree, or turmeric, to the mix. 2. We now need to ferment our dough. The way I do this is to pour 1/2 cup of water into a microwavable cup, and heat it for 20 seconds or so until it begins to steam. This creates a nice, humid environment inside the microwave - the perfect conditions for our yeast to activate during the fermentation process. Then, I simply place the dough inside the microwave next to the steaming cup, and close the door - done! Leave the mixture to rest for 45 minutes. After the fermentation, you should notice that your mix has grown in size. While we leave the dough to rest, let's make some fillings! I will quickly guide you through the fillings, pork mince, curry, and pizza - but you can choose whatever you like. 1. Sautée the white onion, and leave it to cool. 2. Combine all the ingredients together, and mix well with a spoon. 1. Sautée all the vegetables, add the meat (or anything you like) and stir until well-cooked. 2. Add in the 1/4 stock cube, some curry powder (for the curry filling) or tomato sauce (for the pizza filling), and some seasoning for your preferred taste. The important thing here is to flatten the dough from the outside, so as to keep the centre somewhat thicker than the rest so that the fillings are protected. 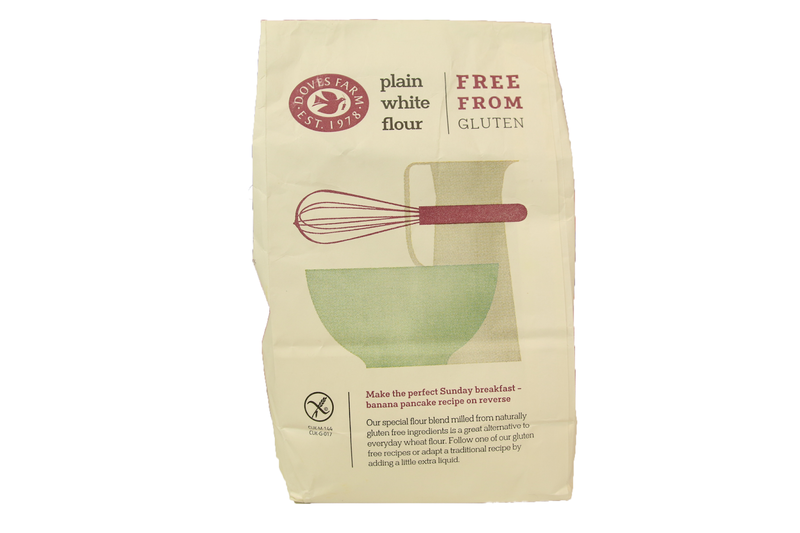 By dusting your fingers with a bit of flour, the dough shouldn't stick to them, which makes this process easier (just be a little careful to not use too much as this can dry out the dough, which will make it more difficult to handle). To make my dim-sum style buns, pinch one part of the dough, and then pinch the next part, and bring them together in order to seal the edge. If you find that you are making holes in the dough or that it really wants to fall apart - hang in there! Just keep going, and fix/adjust as you go along. After shaping the buns, place them onto a well-oiled plate, otherwise they will stick and require re-shaping. While the completed buns are sitting, don't forget to cover the dough with wet kitchen towels/cloths until they are all finished - this will keep the dough from getting dry. 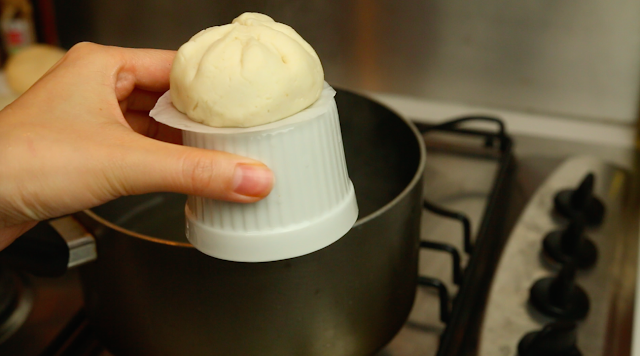 The simplest and the most authentic way to steam these buns, is to use the bamboo steamer! * However, let's forget about that, as we can still steam them even if we don't own one! All you need is a large pot, some steaming boiling water, and some small cups, placed upside down with a cooking sheet on top. * You may possibly find a bamboo steamer in your local Asian supermarket, which can really be a good investment for healthier cooking. If you live like us in Brighton, UK for example - Yum Yum Oriental Market have them in stock in various sizes, for around £3-5. Next, with enough water inside the pot (not too much, as the water level needs to be below the top of the cup), boil it up so as to create a lovely steaming environment for your buns. Then place the cup upside-down, with a bun on top! Be careful not to drop the buns into the water. But if you do (as I have, repeatedly) then do not panic - just pick it up with a spoon and place it again on the cup - it'll still be nice and fluffy. If the cups are moving too much due to the bubbles in the boiling water, turn down the heat a bit to calm it down. Most importantly, please mind your fingers! Another method, if you have a bigger pot, is to place one cup in the centre and all the buns on a small plate, balanced on top of the cup. For this to work there should be a good amount of space between the plate and water level, in order for the steam to circulate. Using this method, the plate needs to easily fit inside of the pot. The plate in my video was too big for the pot, so I went with individual cups. 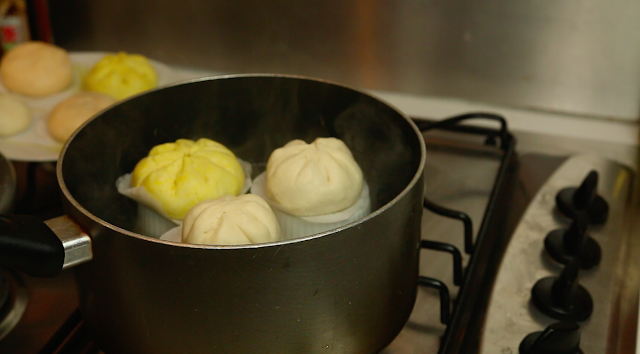 Now, we leave the buns for 8 mins on high heat, then turn off the heat and leave to steam for an additional 3 minutes. Keep a lid on your pot for the duration, so as to keep all of the steam inside the pot. These buns are at their best when eaten freshly made, but tasted surprisingly good when we tried them the day after. Texture and flavour was still quite good after warming it up in a microwave, with a splash of water.